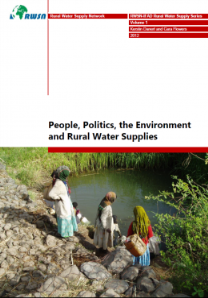 Producing a series of concise guidance publications, primarily for IFAD agriculture projects that have a rural water supply component. There is a growing interest within IFAD country programmes in drinking water supply projects, with some countries having already commenced work in this area. However, as this topic has not been a core part of IFAD’s work in the past, there is concern that efforts need to be made to ensure that IFAD supported drinking water supply projects are undertaken according to the best international standards and practices. The Rural Water Supply Network (RWSN) is a global network of professionals and practitioners working to raise standards of knowledge and evidence, technical and professional competence, practice and policy in rural water supply and so fulfil the vision of sustainable rural water services for all. This assignment built on the extensive experience of RWSN existing publications and support IFAD to prepare materials which can be utilised by its country programmes. These have become among the most downloaded publications from the RWSN website.